So I'm going to make these a bit of a normal thing. Most of the time I'll share videos that are fascinating me at the moment but sometimes it will be other things. This is my current obsession! I have gotten into watching the bouldering world cup. 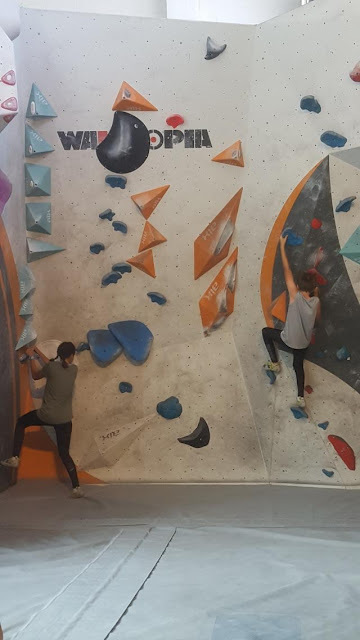 For anyone not really in the know (which was me about 2 weeks ago) bouldering is actually a sport you can compete in. What is bouldering you ask? It is rock climbing without a rope. They leap and stretch and climb in ways I can only dream of being able to do. If you want something interesting to watch while stitching away I would recommend putting it on (yeah it's 3 hours long but it's an excuse to craft) and watch some amazing athletes.I do usually skip the introductions at the beginning to get to the climbing. This hasn't just come out of nowhere. 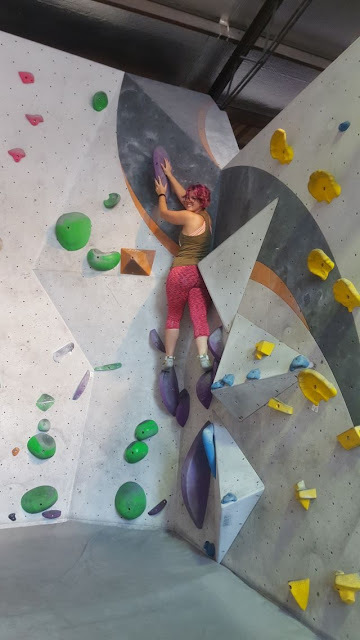 Here I am below climbing a purple level wall. This one is only a step up from beginner and it took me a number of tries! My sister is big on rock climbing particularly bouldering and I know why she loves it. It is great exercise and so much fun for everyone. See what I mean by everyone? The kids love it too every time we take them! Actually they often get a chance to go more times than me, as they are free more often. Anyway I hope you enjoy this video if you have time to watch it. What do you do to exercise and have fun?